Australia is a pretty big country, so making your way around isn't always simple. Flights are the easiest way to make your way from Point A to Point B. Unfortunately flights are also expensive, you won't always find one where you want, when you want, and you miss out on seeing some of the lesser known places around Australia. Here are a few tips for making your way round this wide brown land. All of the trains run through Adelaide, so you can connect with other services along your trip. There are many ways to travel, and there are some quite luxurious options. This is probably one of the more expensive ways to travel, but they also have special rates for backpackers. These are the major train journeys, but you'll also find services run through V/Line, CountryLink, TransWA and Queensland Rail. This is one method of transport which is generally known for convenience over experience. There are bus networks that run all through the states, and across country. 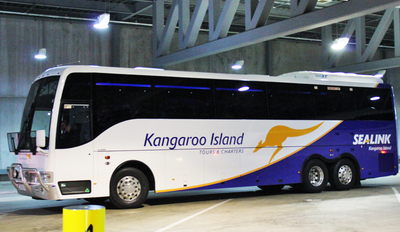 One of the main services is Greyhound, and they offer busses in every state other than Tasmania. V/Line and CountryLink also offer a range of interstate travel options. 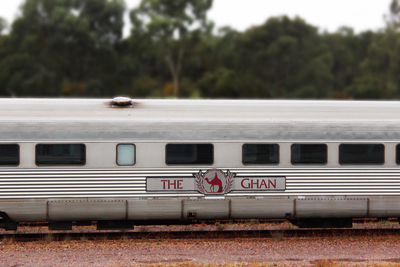 If you're sticking to one state, then you'll often be able to find regional services that will take you to both big and small country towns. Here are some resources for finding interstate, regional, and rural bus services in New South Wales, Northern Territory, Queensland, South Australia, Tasmania, Victoria, and Western Australia. A lot of long haul bus trips happen over night, so at least you'll get to spend most of your time sleeping. If you're travelling between major cities investigate the price of flights first before booking a bus ticket, sometimes flight specials will actually end up cheaper. Hiring, or buying, a van has always been a popular way to get around Australia. If you're driving with a group it can actually end up being a reasonably cheap way to travel. 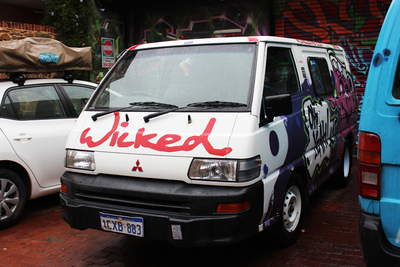 There are plenty of companies to choose from including Britz Campervans, Wicked Campers, Apollo, and Spaceships. Prices and policies vary with each company, so you're best doing your own research to find which one best suits your needs and your itinerary. Obviously you'll need to have a drivers licence. Check out the regulations for each state regarding international licences, and make sure you're up to date with the road rules. Make sure you're travelling with enough water, and consider whether you'll need any extra fuel. Invest in insurance, otherwise things will get a lot more expensive if something goes wrong. Plan your rest stops, and research free camping sites along your journey. 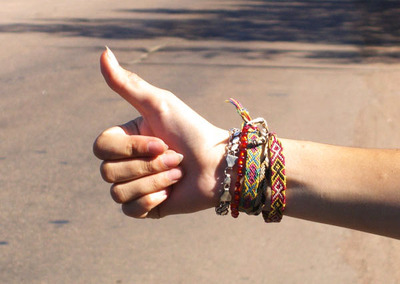 One of the cheapest ways to travel would have to be hitchhiking. While it's kind on your bank account, this isn't an option that will suit every one. You are in a non-pedestrian zone like a freeway or motorway. You are standing on any part of the actual road. Hitchhiking from the footpath is generally considered okay. You are requesting for a car to stop in a no-stopping zone. A great way to hitch a ride is to actually chat to other travellers at hostels and see if anyone is planning any trips, you might be able to join up with another travelling party who already have their transport sorted. It's a bit safer than regular hitchhiking, because you already know who you'll be travelling with. Safety should always be considered. There's no surefire way to make sure that you're not hitching a ride with someone shady, but it's usually a good idea to trust your instinct. If you have a bad feeling about someone it's probably best not travelling with them. Always keep in contact with friends or family, and make sure someone knows where you're travelling. It's also a good idea to always have some water on you, just in case you get stuck for a few hours without a ride. Let us know your stories about travelling throughout Australia, and how you made the trip.